November 2018 witnesses a two-fold increase in flood occurrences reported in comparison to the same period during 2017. 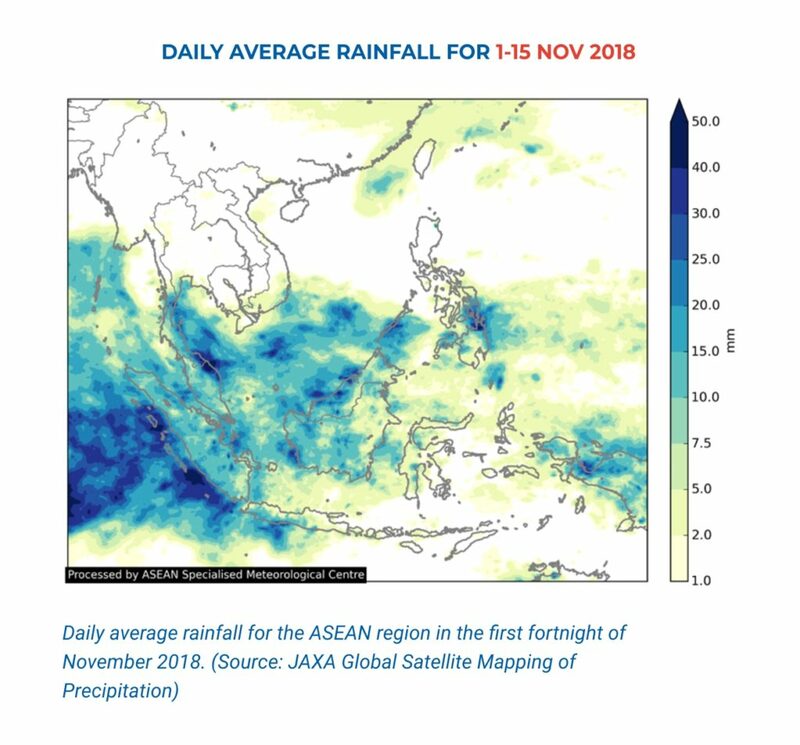 As the region enters the “winter” monsoon period, the southern parts of ASEAN generally experience heavier rainfall, particularly in areas around the equator (shown in Figure 1) where precipitation patterns are generally higher. The heavier precipitation patterns (darker blue areas) are also brought about by typhoons and tropical storms, with these hydro-meteorological phenomena contributing to the increased flooding and collateral hazards (e.g. landslides) reported in the last month. 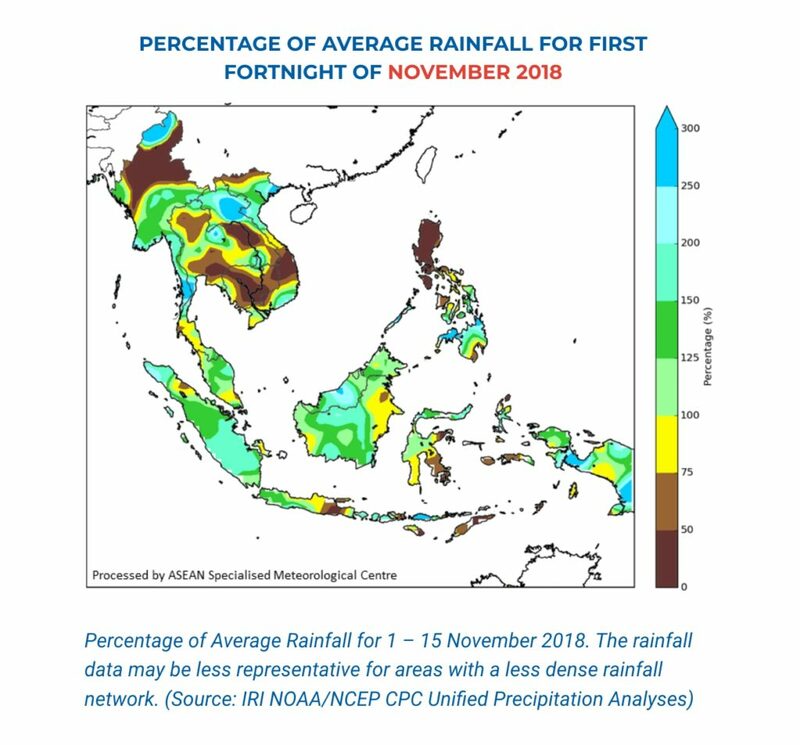 An interesting note is that there was still drought reported in Indonesia – although this is coming to an end as the rainy season approaches. In terms of geological hazards, 20 earthquakes of higher than magnitude 5.0 were reported during November 2018, compared to 22 during November 2017. 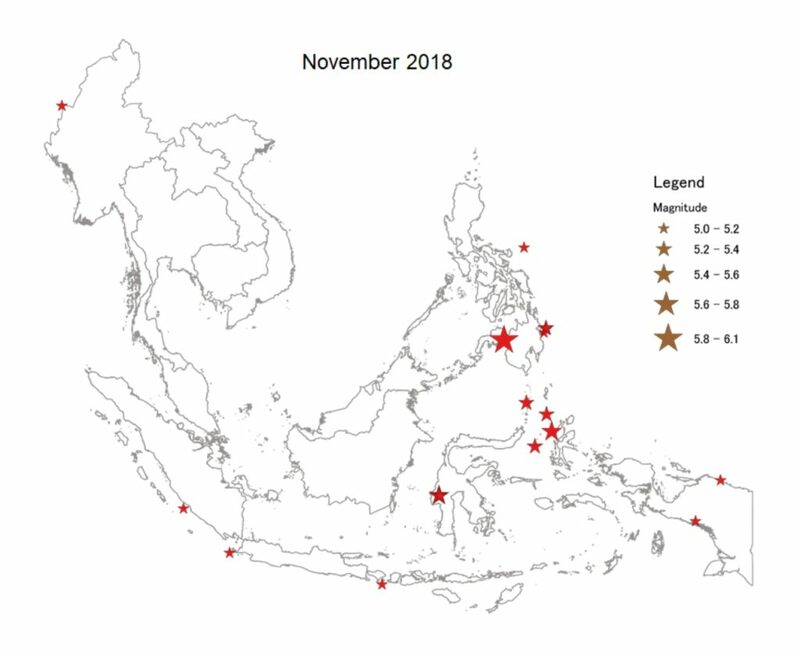 Even though there were fewer reported earthquakes in 2018, the earthquakes were widely distributed across the boundary of the Indo-Australian plate, compared to being concentrated in the Ambon Sea in November 2017. 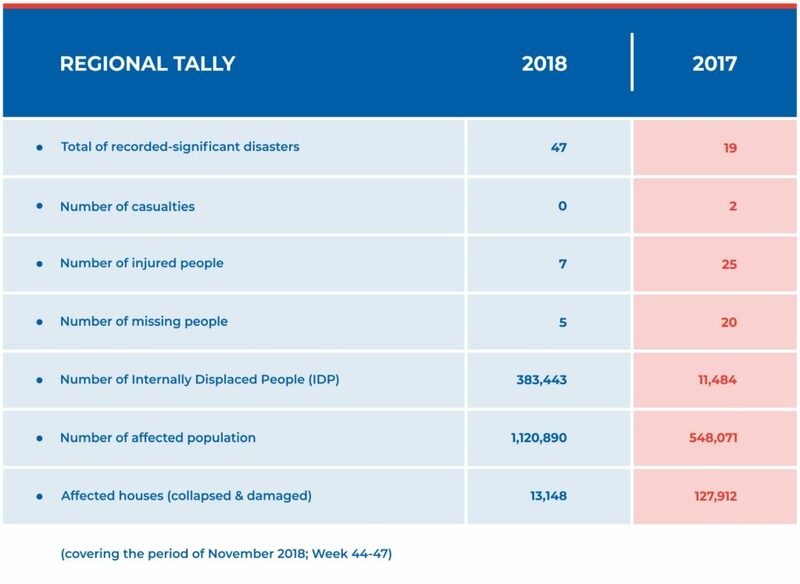 Of concern are that 45% of these earthquakes were registered with a depth of less than 20km, which increases the likelihood of damage and disaster in nearby communities. 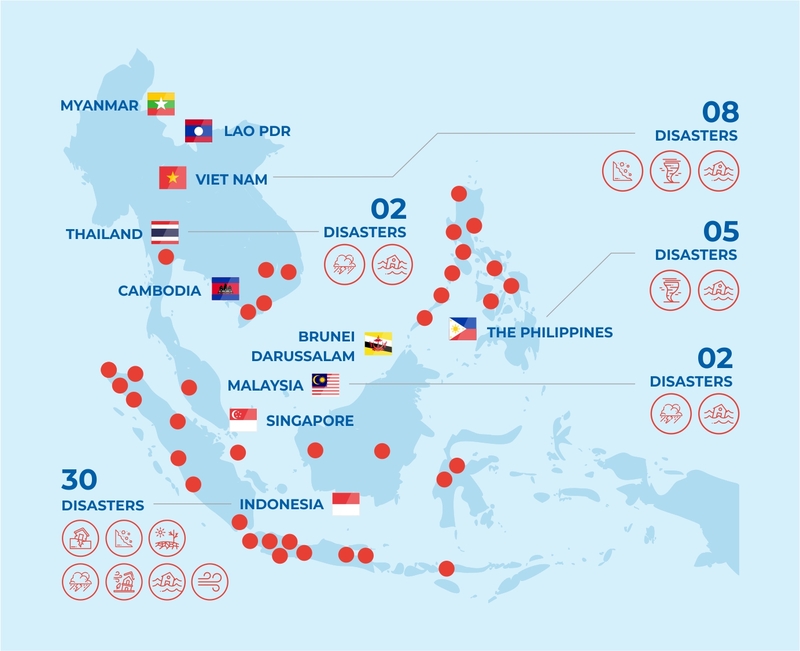 In 2018, the reported earthquakes mostly occurred in areas with higher vulnerability – including in Eastern Indonesia and southern parts of the Philippines. There are currently six active volcanoes in Indonesia (Krakatau, Merapi, Agung, Semeru, Ibu and Dukono), as well as one in the Philippines (Mayon) on which recent volcanic activity has been reported. There is an increased probability of above-average rainfall over the western equatorial region (parts of northern Sumatra, Peninsular Malaysia and Borneo). During this season, the monsoon rain band is forecasted to gradually shift south towards the Equator with an increased likelihood of shower activities and winds of light and variable direction. Shower activities are expected to persist until January 2019, reducing in the approach to February. 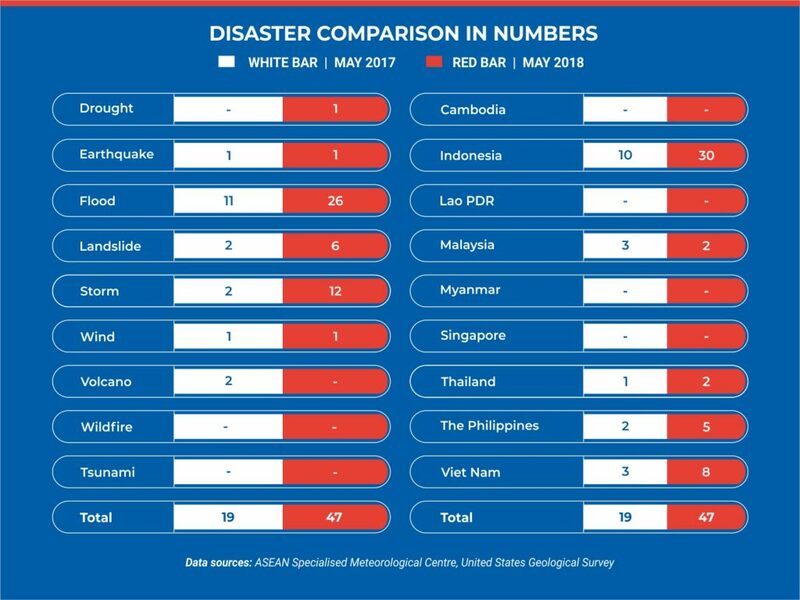 Due to rainy conditions, hotspot activities in the southern ASEAN region are likely to remain activities in the southern ASEAN region are likely to remain subdued. Collateral hazards to heavy rains, such as landslides, should be monitored during this period, as heavier precipitation may trigger isolated incidents in hilly or mountainous areas. Modeling has indicated that tropical Pacific Ocean sea surface temperature anomalies are not expected to warm much further. The probability of weak El Niño conditions occurring will peak during the October-December 2018 season, and will weaken beyond the first quarter of 2019. Due to the weak El Niño conditions, tropical typhoon forecasts remain at up to 3 potential typhoons until January 2019, with a slim chance of any forming during February*. *) Information courtesy of the Philippine Atmospheric, Geophysical and Astronomical Services Administration (PAGASA).